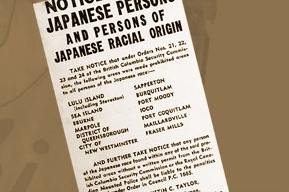 Apart from its treatment of indigenous peoples, Canada’s greatest shame as a nation is the internment of Japanese Canadians during World War II. 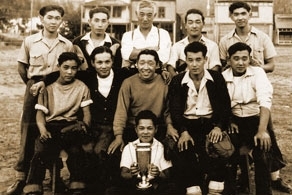 As a result of this internment, a team that formed a dynasty – the Vancouver Asahi – was disbanded. This is the remarkable story of that team. I had never heard of the Vancouver Asahi before I visited the Canadian Baseball Hall of Fame. As I said in the post, the Asahi were a team based out of Vancouver that won 5 consecutive Pacific Northwest Championships in the 1930s. Curious, I decided to find out more. 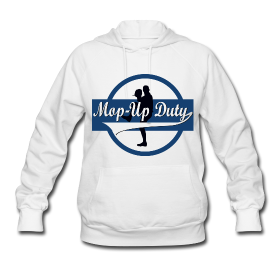 The story begins in the late 1870s when an American introduced the game of baseball to Japan. Colleges and Universities in Japan enthusiastically embraced the game and began to form teams. 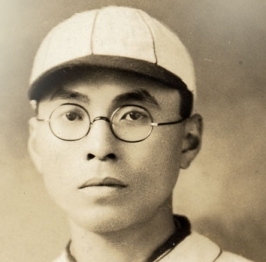 Upon graduation, these young Japanese men emigrated to British Columbia, Canada, in search of a better life and brought the passion for the game with them. 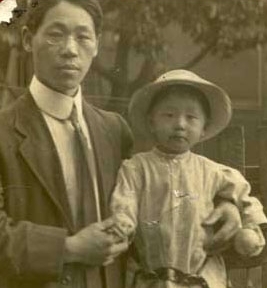 These first-generation Japanese (known as “Issei”) had families and passed their baseball (yakyu) knowledge on to their children, second-generation Japanese Canadians (Nisei/Nikkei). These Nikkei, in turn, came to love the game. 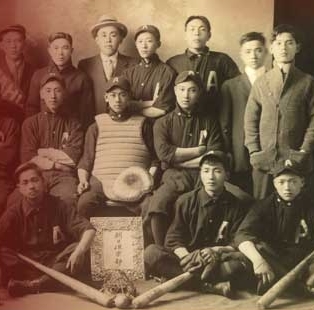 After 1900, Nikkei baseball teams formed all over British Columbia wherever there was a significant Japanese population. There were teams in the Okanagan, Fraser Valley, Ocean Falls, Cumberland, Victoria and in Vancouver; namely Powell street and the Kitsilano & Fairview suburbs. 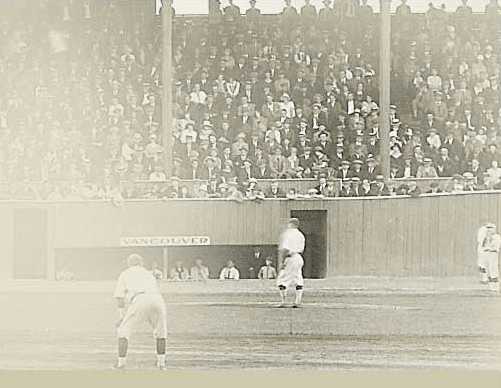 In 1910 Vancouver’s first professional baseball club was formed, the Nippons. They evolved into the Vancouver Asahi (the morning sun or rising suns) in 1914. They attracted many of Vancouver’s Nikkei community to their home park of the Powell Street Grounds (now Oppenheimer Park). 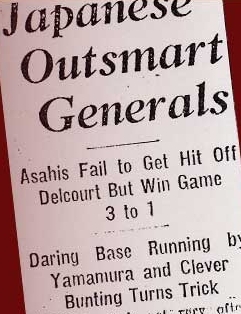 In Canada and the United States before the Second World War, there were separate leagues for players belonging to visible minorities so the Asahi were relegated to playing other Nikkei teams or barnstorming “coloured” teams. In 1914 a local shopkeeper by the name of Matsuhiro Miyasaki took the helm of the team as manager and president. 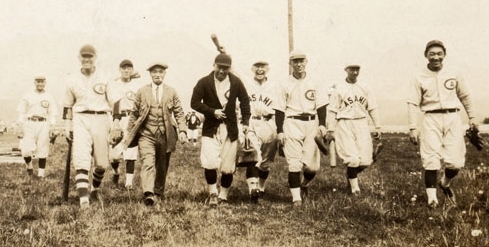 His dream was to take the Asahi and enter them into the Terminal League to face the hard-hitting anglo-Canadian baseball clubs and to eventually win a championship. Miyasaki made his players practice placing bunts until they could hit them with precision anywhere. Runners would bereadied on the bases. Hit-and-runs and suicide/safety squeezes would be yelled out in Japanese. Before the bat touched the ball, they were on the run, expecting to score two runs off a single bunt. The Asahi’s “brainball” began to generate a tremendous amount of interest in the team. Brainball reflected the traditional Japanese cultural values of discipline and teamwork. 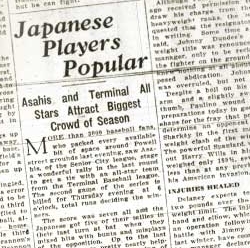 At a time when Japanese immigrants faced unremitting discrimination, the Asahi’s athletic and sportsmanlike performances inspired both Japanese and Anglo/Euro-Canadian fans alike, and helped bridge the generation gap as baseball became a common ground of interest for Issei (immigrant Japanese) and Nisei (first generation of Japanese born in Canada). 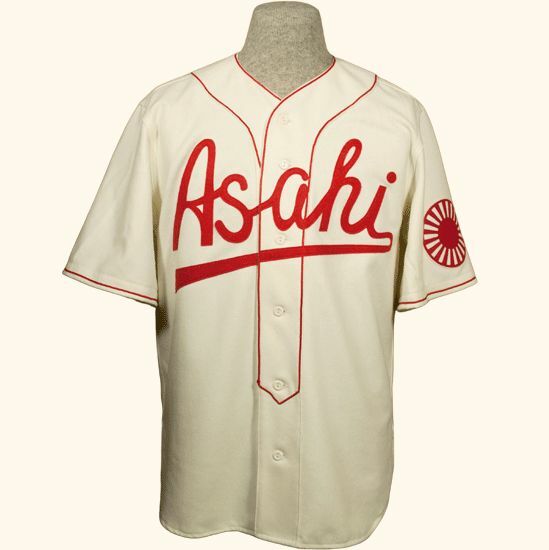 In 1919 the Asahi won their first championship, winning the Vancouver International League – a league consisting of many Anglo-Canadian teams. From that point forward the organization fostered a winning reputation and attracted the best players and coaches from other Nikkei teams. 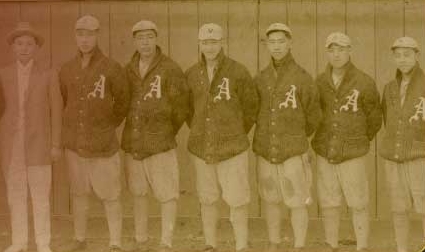 In 1920, the Asahi were one of four clubs to play in the Vancouver City Senior Amateur Baseball league, with the Independent Longshoremen’s Association, Canadian Pacific Railway, and Sprott-Shaw teams. The club then joined the Terminal League and in 1926 Miyasaki’s dream was realized when the Asahi won the Terminal League playoffs. It was only the beginning of the Asahi’s accomplishments as the success continued in ensuing years. The team won 4 consecutive Terminal League Championships in 1930 and 1933, a run of Pacific Northwest Championships from 1937-1941, and a triple-championship season in 1938 where they were the top team in the Burrard, Commercial, and Pacfic Northwest Leagues. The Asahi club became a dynasty of champions. The team won ten city championship titles from 1919 to 1940. The club developed a farm system with as many as four teams to identify young talent (children were selected as young as 8 years old) that might someday play for the senior team. This was every young boy’s dream in Vancouver’s Little Tokyo community. In 1942 a paranoid Canadian goverment led by Prime Minister Mackenzie King enacted the War Measures Act. 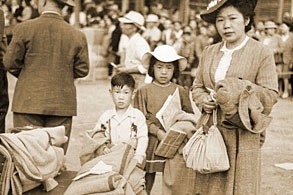 This Act allowed the government to intern “all persons of Japanese origin.” A 160km strip of land was created to send these Japanese to work in road camps. At the same time, all of the interned Japanese had their personal property confiscated by the government to be auctioned off. The Nikkei communities that thrived on Canada’s west coast were destroyed. 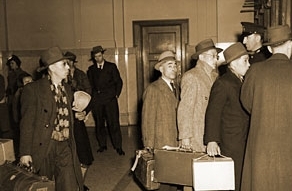 Though these interned Japanese Canadians were only allowed to bring with them what they could carry, many brought with them their Asahi uniforms, gloves and pictures of the team. When the war ended, Japanese Canadians were forbidden from returning to their homes on the coast (which had been sold off anyway). They were given an ultimatum: return to Japan or disperse east of the Rocky Mountains. 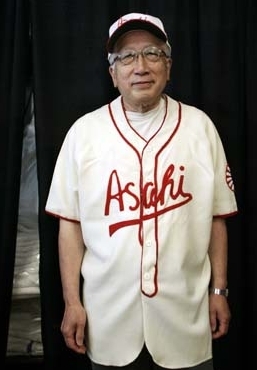 This effectively put an end to Asahi baseball. In 2003 the Toronto Blue Jays’ marketing campaign was “Great Moments in Baseball.” It was a celebration of the greatest moments in Canadian baseball history. 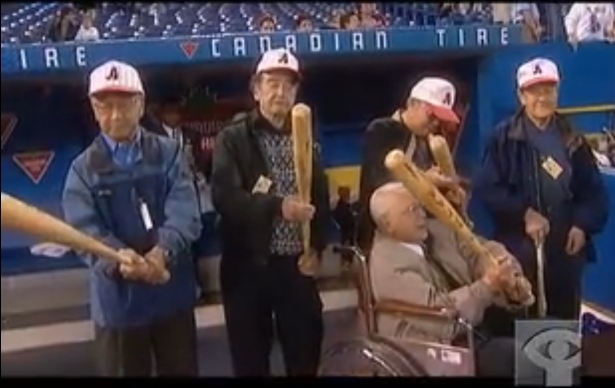 During a game the surviving members of the Vancouver Asahi were honoured at the Sky Dome and were inducted into the Canadian Baseball Hall of Fame at the same time. 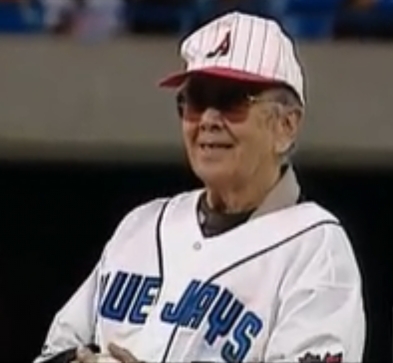 The Blue Jays and the CBHOF made sure that the proud name of the Asahi that had instilled such hope, spirit and pride into its people will not be forgotten. For more on the Vancouver Asahi, make sure to watch Jari Osborne’s spectacular 2003 film “Sleeping Tigers: The Asahi Baseball Story.” Produced by the National Film Board of Canada, the documentary combines archival film and dramatic recreations, along with interviews with the last of the Asahi. The 50-min. film garnered four awards including a Rockie Award for Best Sports Program at the Banff Television Festival and a Golden Sheaf Award. 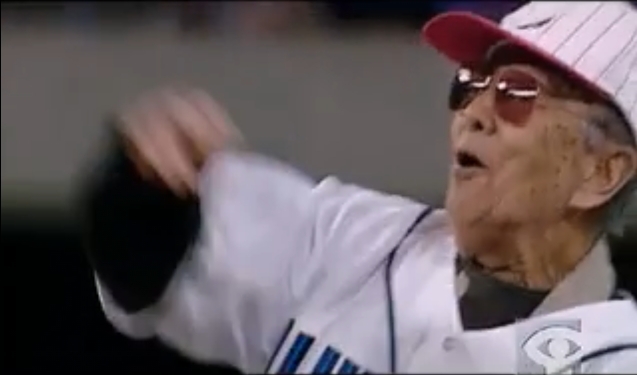 It also features footage from the ceremony honouring the Asahi at the Sky Dome. It is truly incredible to see the surviving members of the Asahi sing along to the national anthem after all of the misery they were put through at the hands of this nation. Thanks for an incredibly heartbreaking and illuminating story. I had no idea of the Asahi’s success and dominance. What a story. Thanks for this, Callum. The Canadians have done some events for the Asahi in the past; hopefully there’s something this coming season as well. Fantastic read. I’ve never heard of the Asahi until this article. Thanks for making my evening. Hey Callum, I tweeted you but to add to my tweet. My Great Papa pitched for the Provincials and the Young Liberals, I just received from my Papa (His son) a bunch of old newspaper clippings straight from the 1920’s, it talks about the whole City League in it (Asahi’s Included) I am just looking to get more information about my Great Papa if there are any databases out there? That would be a great help! Thanks! Go Jays! Thank you for a very informative and senitive article. The pictures with it are priceless. This is true history for sure.